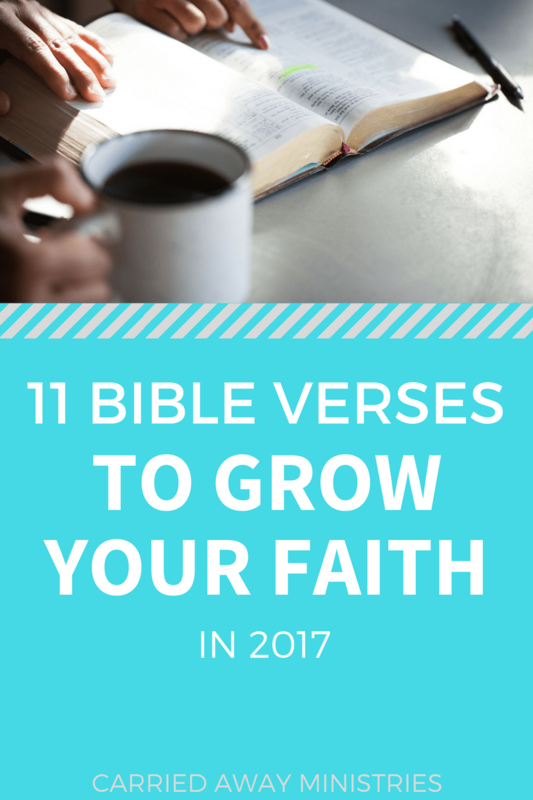 Today is the ninth post in the series: 11 Bible Verses to Grow Your Faith in 2017. In each post, I will introduce one name of God and one Bible verse that will grow your view of God, and in turn grow your faith. If you missed the others, here they are: post #1 , post #2 , post #3 , post #4 , post #5, post #6, post #7, and post #8. Forgive me for completely omitting a nice, fluffy post introduction. I just don’t have it in me today. Because as I pull up to the table to type, I can’t stop thinking about my dear friend who is planning her mom’s funeral this week. I’m thinking about a friend who just recently gave birth to her precious newborn without a heartbeat. I’m thinking of all the stories and all the faces of all the people who have sat in grief and doubt and questions – people who have prayed for healing – who have begged God for more time – and still found themselves grave-side, bewildered and undone. And also, because last week Las Vegas happened. And I can’t get on Facebook anymore without feeling broken over something. Or someone. So today, I’m delivering some straight talk about suffering and pain and heartache and death. And the One who is our Healer. 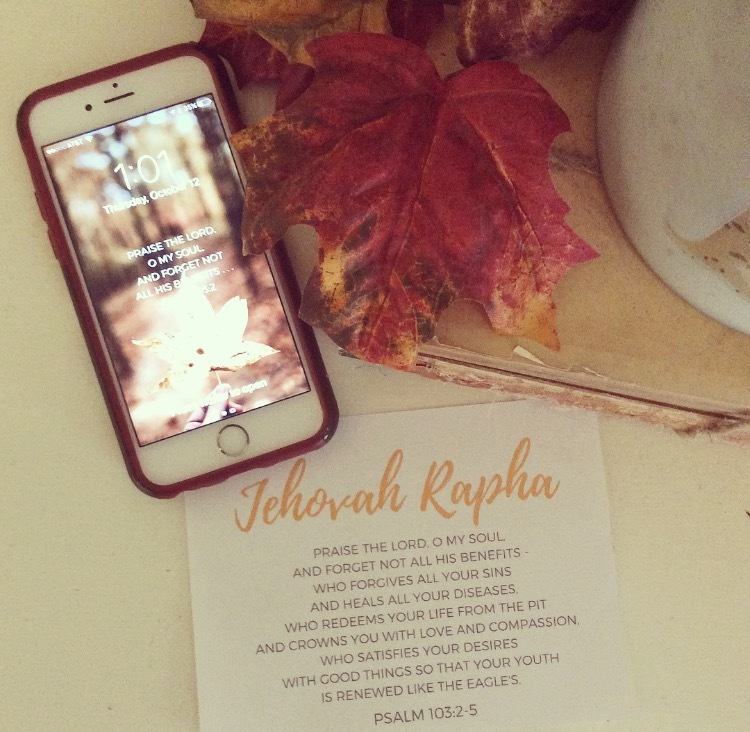 Early in the Israelite’s wildness-walk, God revealed Himself as Jehovah Rapha, The Lord who heals. It’s a name I’ve been familiar with for a long time, but when I began my study of God’s names, it was one I didn’t want to touch. How do you teach about a God who heals when your thoughts are clouded by the times when He seemed to fall silent? What do we say when we pray, and healing doesn’t come? In ignorance and pride, I felt like I would need to apologize for God missing it, for the times when he dropped the ball or didn’t come through. Because sometimes it seems like He turns a blind-eye, doesn’t it? But in my pursuit of God in this name, I learned something: We can’t confuse this life with the character of God. We can’t gather up all the suffering, pain, and tragedy of life on earth and use those things to shape and define who God is. The truth is God isn’t who I think He is. God is who He is, whether I know, understand and believe Him or not. My knowing and understanding doesn’t limit God’s ability to act, nor does God need me to defend or justify Him when I assume He’s not. And, He certainly doesn’t need me to try to tie up all life’s loose ends into a pretty little bow so that I can make sense of Him. God is infinitely bigger than we think He is. He’s wild and untame-able. His ways are so far beyond all of us. So when God reveals His name as Jehovah Rapha, the LORD who Heals, He’s telling us who He is, but He’s also telling us what He does. God IS our Healer, and healing is what He does. The two cannot be separated. We either decided by faith to believe Him, fully and completely, or we don’t. Now back to our questions …. If God is who He says He is – our ever-present Healer – then why don’t I see more evidence of His healing? My answer: My perspective is so limited – so fixated on the temporal here and now. I say, “God, please heal her.” And He says, “I am“, then brings her home (to heaven). Let that swirl around in your mind for awhile. Two things before I share the verse(s) for this month. #1: Like with most Hebrew words, the word rapha means much more than “to heal”. Listen to the full definition: “to heal, repair, purify, restore, recover, refresh, relieve, cure, make whole.” The word picture for this root word is one of sewing back together. What an intimate, up-close and personal thing – to be held that way – in the Father’s hand – being mended back together. Being healed. #2: We all are in need of way more than physical healing. Think about it – physical healing is actually small in comparison to our greater need for emotional healing, mental healing, relational healing, moral healing and spiritual healing. Do you have any relationships that are in need of repair? Any thoughts or motives that need purifying? Would you like your life to be restored back to its useful state? Would you like to refresh those hopes and dreams that have been spoiled or contaminated? Are you looking for relief from a longtime pain or burden? Would you like to be made whole? This is the work of our Healer, Jehovah Rapha. This month I chose a passage for us to memorize. I’ll share the verses first, then explain why. It’s easy to complain about this life. There’s so much out there to discourage, depress, and distract us. But as followers of Jesus, we can choose a different way. 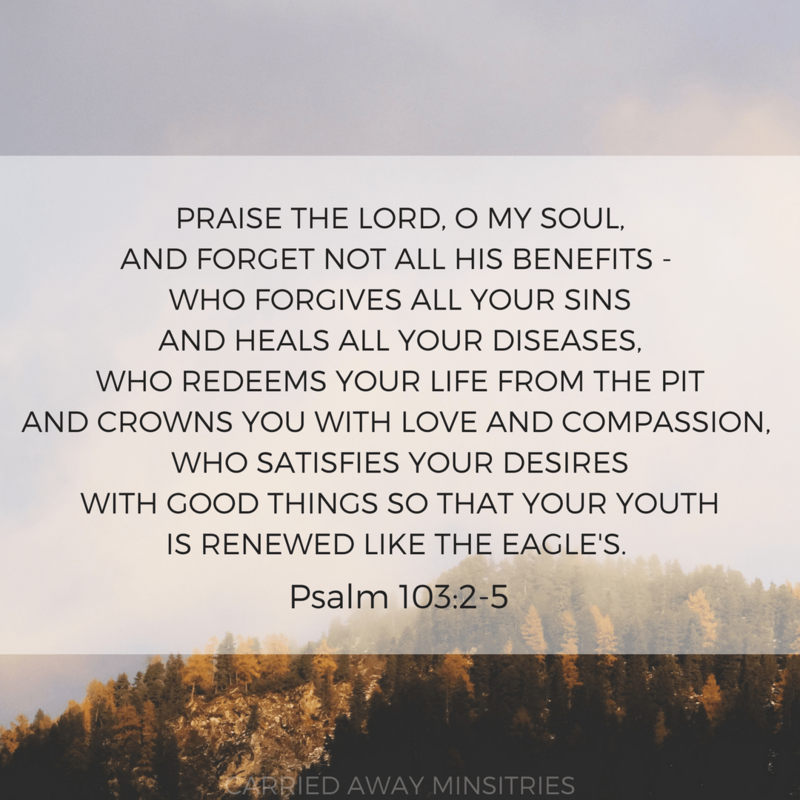 This beautiful Psalm lifts our eyes and refocuses our heart on the gifts we have in Jesus, who promises to forgive, heal, redeem, crown and satisfy. 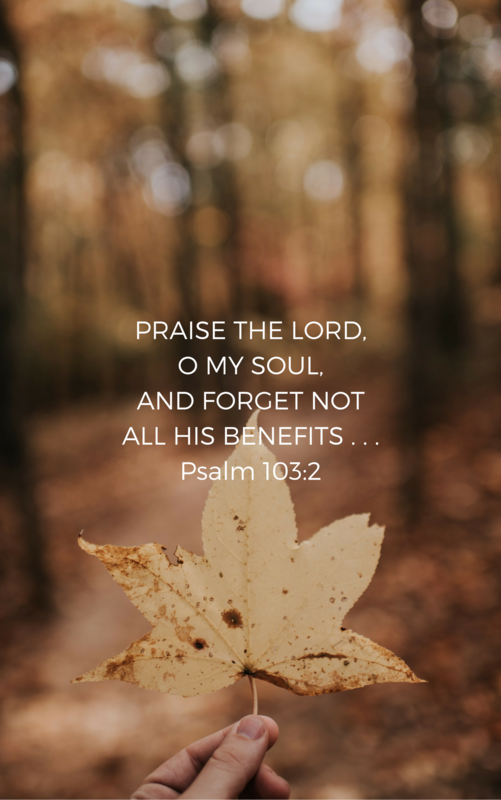 Whether you choose to memorize the entire passage or just the first verse, use it as a springboard of praise for a God who gives us far more than we deserve. Click here to download the memory verse cards, and here to download the wallpaper images. #2: LOOK TO JESUS AS YOUR HEALER. When we turn to the LORD – when we look to Him and listen to Him alone – He promises to be our Healer. So, this is what we practice. Over and over and over again. I hope everything is alright, because I see you have not posted “ten and eleven” of this series. Hi Carrie, interestingly, a few days ago, I observe your monthly memory verse challenge and I realise it was for “2017” but I saw it because, for me it was for “2018”, for now. I am not learning them in any particular pattern. Once I am ready to move on, I would learn a new one. I really love Jeremiah 32:17. “Ah Sovereign Lord” ! No one can match is power. I am now on the second verse and enjoying it. I enjoy stopping by every now and then. You are an inspiration to me as I continue to allow God to use me through my blog; https://inspireothersonline.com/ Keep doing what you do to lift up other women like myself. There are lots of circumstances in our lives that can discourage us, but God’s word does the opposite for us and our spirit. You need to know that you are a blessing to others, as they read your posts and participate in your challenges. Feel free to stop by anytime to visit InspireMe. Pursuing Purpose! Have a wonderful day!